1. Preheat oven to 320 F. Bring cream and coffee beans to a boil in a medium saucepan. Cover, and reduce heat to low; cook at a bare simmer 30 minutes. Pour mixture through a fine sieve into a pitcher. Discard coffee beans. 2. Put egg yolks, granulated sugar, and salt into a large bowl. Whisk until sugar is dissolved, and the mixture is pale and thick. Gradually add cream in a slow, steady stream, whisking until combined. Pour through a cheesecloth lined sieve into another large pitcher or glass measuring cup. Skim any foam or bubbles from the surface. 3. Divide custard among 5- 9 oz. ramekins, or 10 half-cup ramekins, filling them almost to the top. Place ramekins in a roasting pan; put pan on oven rack, and CAREFULLY pour boiling water around molds to reach halfway up sides, taking care not to allow any water to splash into the molds. Bake until custards are set around the edges, but still loose in the centers, about 30 minutes for 9 oz. molds, and 40 minutes for half cup molds. 4. Let molds cool in pan 10 minutes; remove from water bath. Cover each with plastic wrap, pressing onto surface; refrigerate at least 2 hours or up to 2 days. 5. 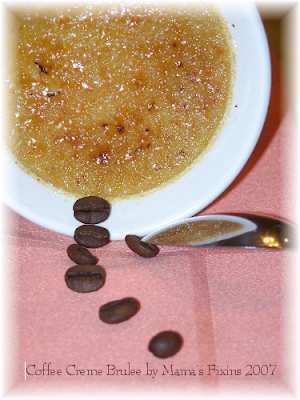 If using a butane torch to caramelize custards, just before serving use a fine sieve to sift sugar 1 tablespoon sugar onto each 5 oz mold, or 1 1/2 teaspoons sugar on each half cup mold. Hold torch at a 90 degree angle, 3-4 inches from the surface of each custard, and use a steady sweeping motion to caramelize the tops until golden brown. 6. If you don't have a torch, freeze custard 20 minutes before topping with sugar. Preheat the broiler, and place molds on a rimmed cookie sheet; surround with ice cubes. Broil, rotating once, until tops are golden brown., 2-3 minutes. If molds become warm, refrigerate custards for a few minutes before serving. Sounds delicious! MMMN! Thanks for sharing the recipe. I've now started a recipe blog too. Just barely getting into it. Come check it out sometime. It's on my profile page.